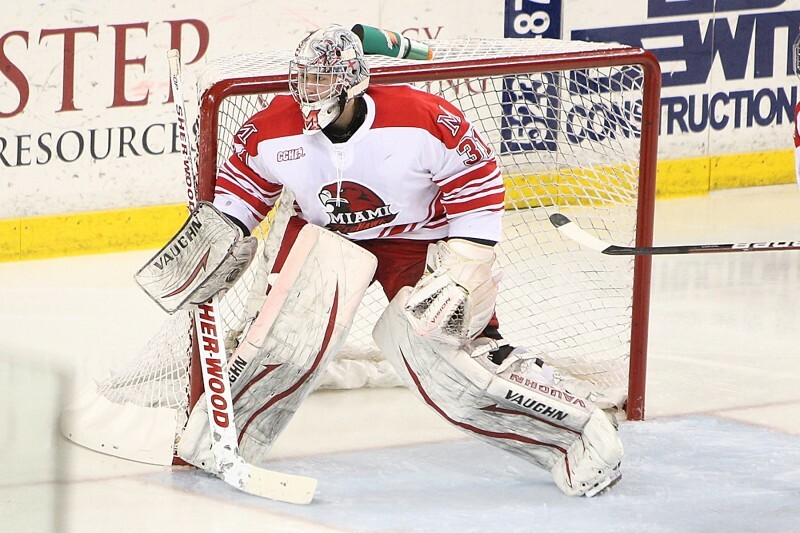 Coming off of a 4 game roadtrip against two other ranked Michigan teams, the RedHawks return to Oxford for a two-game set with the Northern Michigan Wildcats this weekend. Miami got out of Michigan with hard earned splits the last 2 weekends, and come in to the weekend second in the logjammed CCHA standings. 5 teams are 2-2-0 in the CCHA standings, and Northern Michigan is in a tie for 9th (1-2-1, 5 points and 1 shootout loss) in the early going of the CCHA schedule. Northern Michigan will be led by Senior forward Matt Thurber, who leads the league in scoring with a goal and 10 assists. Miami’s sophomore forward Austin Czarnik and freshman forward Riley Barber are both at 10 points on the season, just 1 point behind the CCHA leader. This week’s CCHA Now production features the National Rookie of the Month (in case you’ve been living under a rock, that’s Barber), who is also the nation’s leader in points by a rookie. Walt Kyle leads the Wildcats from behind the bench, and is in his 11th year in Marquette, where he stands 198-170-46. NMU comes to Oxford having blown a 4-1 3rd period lead on Friday night against Michigan (where they lost the shootout), but did pick up a 4-3 win on Saturday night – both games being played in Marquette. The Wildcats have had a truly impressive start to the season, having won twice against Wisconsin (in a non-conference neutral-site series in Green Bay), and splitting a series at Nebraska-Omaha. 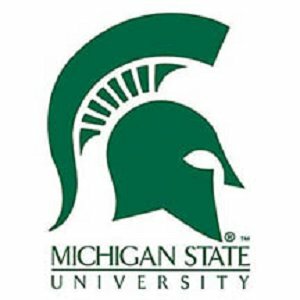 They were, however, swept at home by Notre Dame before last week’s tilts with the Wolverines. 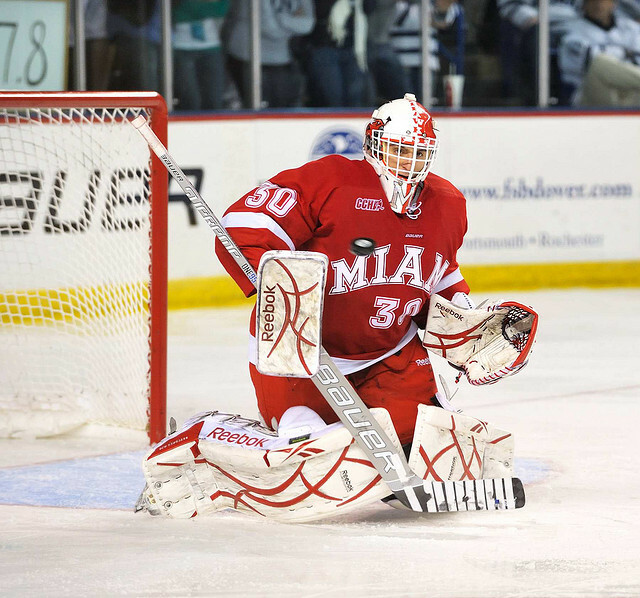 Miami is just 20-34-3 all-time against Northern Michigan, including going 1-3-0 last year. Kyle has a chance to reach 200 wins at the helm of NMU this weekend, but the RedHawks will certainly have something to say about that. 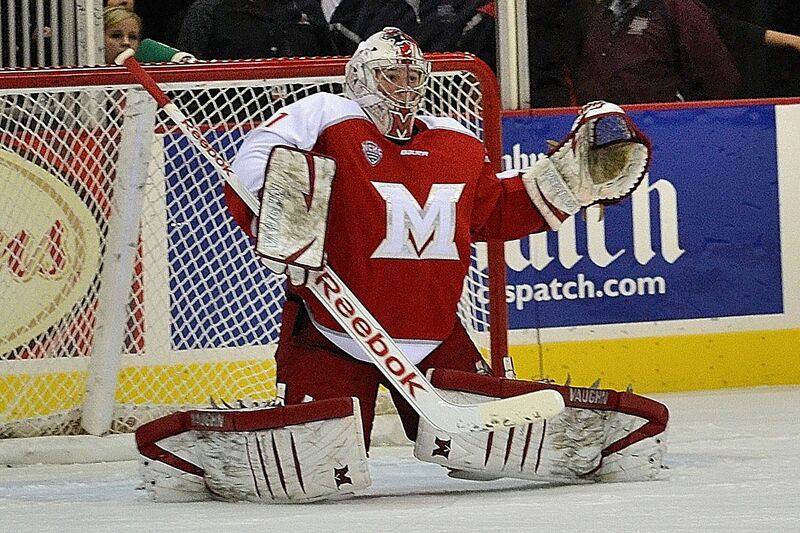 Coach Blasi may return to the goalie rotation this weekend after starting Jay Williams for both games in Big Rapids. Ryan McKay has yet to see action since being injured with a leg or groin injury in the Friday night game at Michigan, and Williams has played all 235 minutes since McKay went down. McKay was still dressed on the bench last weekend as the backup, however, but did not see any game action. Look for another weekend of play similar to what Ferris State showed us last weekend. NMU likes to pack in a bunch of players in the defensive zone to block as many shots as possible. Their defensive style constantly frustrates the ‘Hawks, as evidenced by Miami’s 1-3 record against them last year. Miami’s talented group of freshmen will have to be smart and stay out of the penalty box – something they have done quite a bit this season. 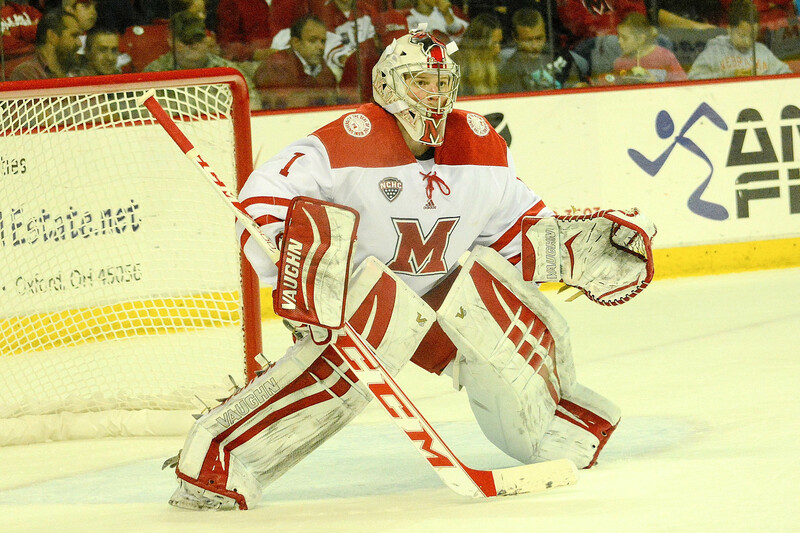 17 of Miami’s 51 penalties (33%) have come from the freshmen group that has seen ice time. Miami has also been called for 2 misconducts and one more 5 minute major on the season. While Blasi’s Miami teams have always been physical and have always taken a lot of penalties, some that we have seen this season have been a tad on the cheap side, and have often come at just the wrong time. This weekend, keep an eye on our twitter feed, as we’ll have a Miami-themed trivia contest during Saturday night’s game. 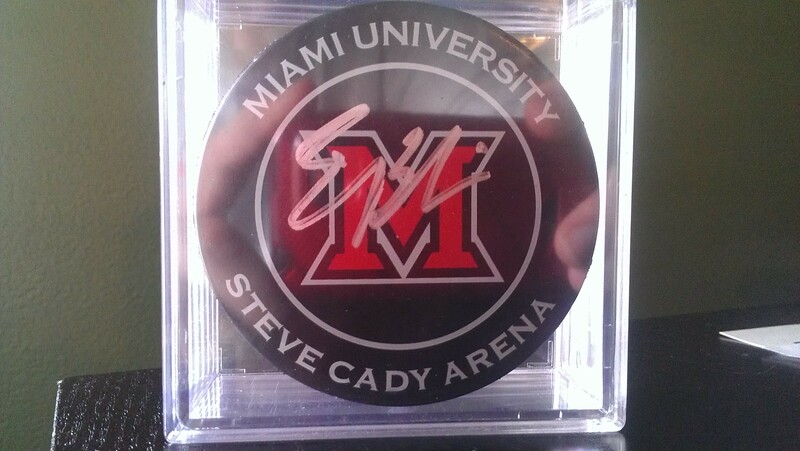 The first response to our question, only asked on our twitter feed, will receive a Miami game puck, signed by Coach Blasi. I’ll take another split this weekend and we’ll stay in touch with the other teams in the league, and will hope that we’re pleasantly surprised if we sweep the Wildcats out of Oxford. Both games will be available for viewing on the Miami All-Access feed (good luck logging in), and on AM 1490 in the Oxford/Hamilton/Cincinnati area. 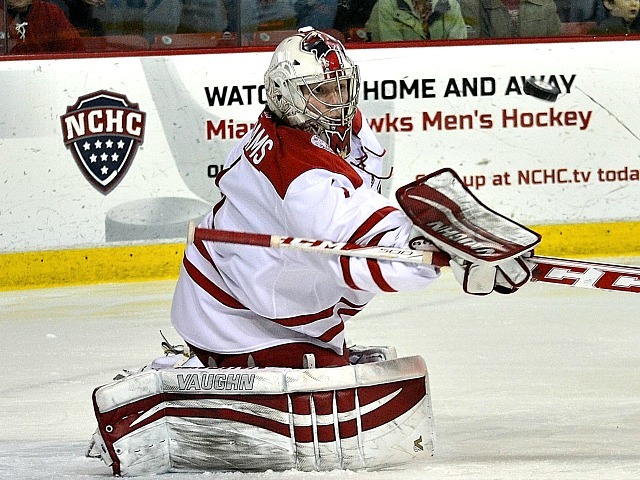 Alex Wideman returned to practice this week. After a couple weeks off due to being sick with mono, we could see Alex return to the ice this weekend. 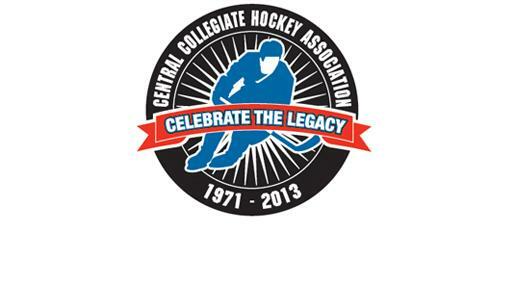 November 10, 1978: Miami hockey notches its first-ever victory against an NCAA opponent. 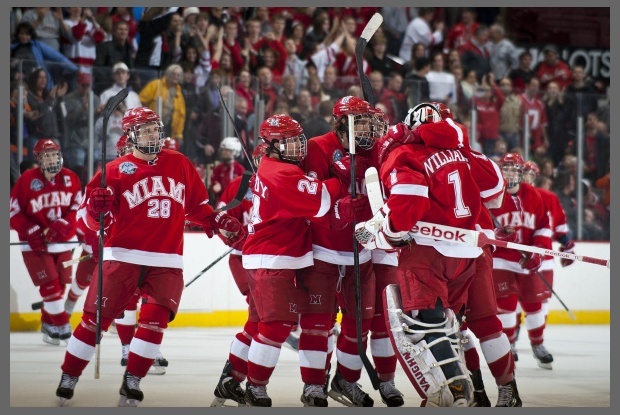 Miami beat the University of Illinois-Chicago 7-4 at the old Goggin Ice Arena. 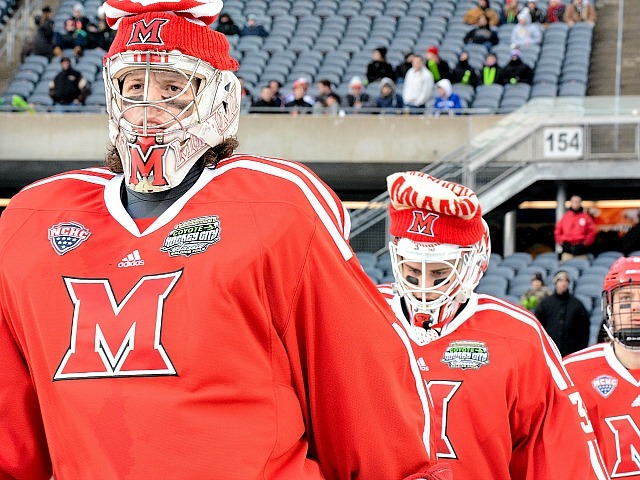 In Miami’s “In the Crease” feature, the 11 freshmen will be featured. 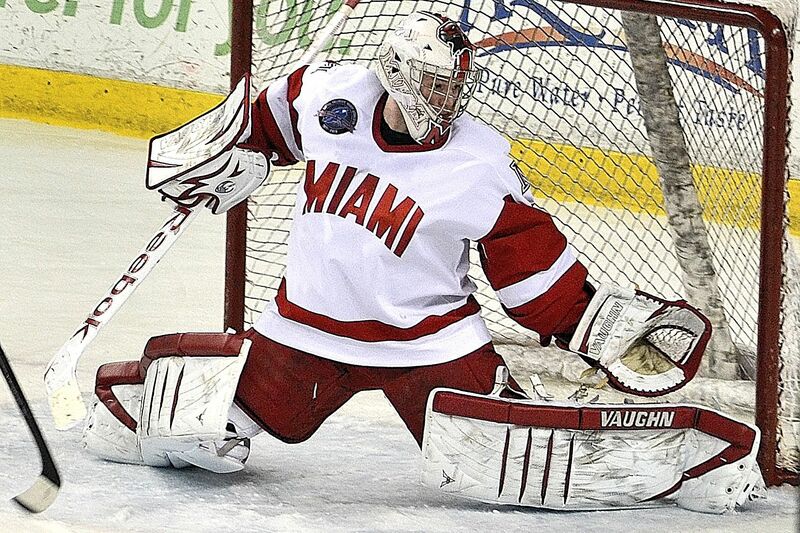 Meet Matthew Caito this week on the Miami Athletics home page.